An example of the various devices that can be connected by the Doceri Collaborative Solution. The What: SP Controls has introduced the Doceri Collaborative Solution, an integrated package that allows meeting participants to share and annotate content while controlling monitors and other AV equipment in the room. The What Else: At the system’s heart is the popular Doceri, an interactive whiteboard and screencast recorder for iPad. Originally developed to give teachers freedom to move within a classroom while annotating presentations, Doceri provides sophisticated tools for hand-drawn graphics and remote desktop control. Distribution and real-time annotation of content are available to and by users of iPads or computers, and content is shown both on the individual devices and a centralized monitor or projection system. 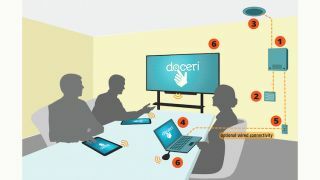 Doceri Collaborative Solution aims to take this control further with the ability to remotely manage AV equipment in the room from the Doceri device. HDMI sources, media devices, audio volume and projector/monitor controls are all available on the iPad via Doceri. Equipment connections in the room are centralized in the secure, easily installed SmartBox II. Devices such as the SP Controls Networked Room Controller (NRC), AmpLinc Hub audio distribution hub, HDMI switcher, and device control pucks are all located in the SmartBox II. The SmartBox II can be preconfigured for individual collaboration room requirements and shipped as a complete system. Pole, wall, and ceiling mounts are available. The Bottom Line: Also available in the Doceri Collaborative Solution are SP Controls’ versatile PixiePro wall panel, a discreet, modular, IR-learning AV control panel; HDMI wall plate for fast connection of two sources, amplifier pucks for driving 8-ohm loudspeakers via category cabling, and Doceri Collaborative Display, a wirelessly connected display for use in conference rooms, huddle rooms, classrooms, and other collaboration spaces. System prices are dependent on configuration.